Syracuse, NY (February 8, 2017) – By popular demand, Disney’s The Lion King will return to Syracuse for the first time since its triumphant premiere in September 2011. This exclusive three-week return engagement will premiere at the Landmark Theatre in Downtown Syracuse on October 27 and will play through November 12, 2017. As previously announced, The Lion King North American tour will unveil a newly-configured production, which will launch in Syracuse, allowing the tour to entertain new audiences in cities and venues which previously couldn’t accommodate the show. In addition to the three weeks of performances, the production will spend five weeks in Syracuse perfecting these technical changes. During that process, a large contingent of crew members, actors and technicians – alongside members of the show’s award-winning creative team – will live and work in Syracuse. “The economic impact of hosting The Lion King for this extended period will be far-reaching, including meals and hotels for over 100 cast and crew members, labor, advertising, vendor rentals and purchases. In addition, the ancillary spending by theatre patrons at restaurants, parking, and occasional hotel stay and shopping will support the local economy,” stated Albert Nocciolino, President and CEO of NAC Entertainment/Famous Artists. In its 20th year, The Lion King continues ascendant as one of the most popular stage musicals in the world. Since its Broadway premiere on November 13, 1997, 24 global productions have been seen by more than 90 million people. Produced by Disney Theatrical Productions (under the direction of Thomas Schumacher), The Lion King is only the second show in history to generate five productions worldwide running 10 or more years. Translated into eight different languages (Japanese, German, Korean, French, Dutch, Spanish, Mandarin and Portuguese), productions of The Lion King can currently be seen on Broadway; London’s West End; Hamburg; Tokyo; Madrid; Mexico City; Shanghai, Scheveningen and on tour across North America, for a total of nine productions running concurrently across the globe. Having played over 100 cities in 19 countries on every continent except Antarctica, The Lion King’s worldwide gross exceeds that of any film, Broadway show or other entertainment title in box office history. 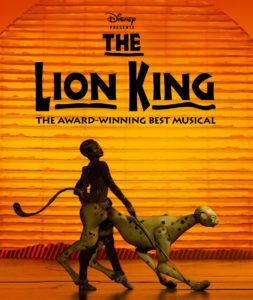 The Syracuse engagement of Disney’s The Lion King is presented by arrangement with Famous Artists and is a subscription offering of the Famous Artists 2017-2018 Broadway Theater Series.